The scent of lemon lingers in the air. I can hear birds chirping outside in the garden as I crack open a window. My muscles feel a bit stiff, but I take pride in their ache. It’s taken me most of the morning, but I’ve finally managed to tidy up most of the house. There’s just one more chore left to do: polish the replica Athenian general’s helm on my desk & the bronze statue of Athena on my altar. It makes sense for me to dedicate this day to chores. At what roughly corresponds to May in the modern calendar, the ancient Greeks celebrated the Kallynteria in honour of Athena, the goddess of wisdom, crafts, & battle. She is proud patroness of Athens, the city which bears her name. The Kallynteria was a time when women swept out Athena’s temple & tended the eternal flame kept there. The 2nd day of the festival was the Plynteria & included a ritual cleansing of Athena’s statue, along with feasting & prayers in the Parthenon. To honour her I choose to start my spring cleaning at this time of year too. Who is this grey-eyed goddess? What is it about her that captivates all who know her? She is the daughter of Zeus. Technically her mother is the titaness Metis, whose name means wisdom. Zeus feared a prophecy that her 1st child would be a girl, but her 2nd child would be a boy who bore enough power to overthrow him, just as he overthrew his father Cronus. He opted to take no chances, swallowing his pregnant lover in effort to prevent her from giving birth to a child stronger than he. Not longer after Zeus was struck w/ a terrible headache. The smithy-god Hephaestus came to his aid, splitting open his skull with a wedge. Out sprang Athena, fully grown & fully armoured. Myth might vary in places, but one consistent point is that she quickly became her father’s favourite child. Zeus entrusted no-one else with the key to his thunderbolts & only she was allowed to wear his aegis or bear his shield. True, she’s a goddess of war. Athena does seem to have a ruthless side. A group of conspirators once trapped Zeus & bound him in his throne. The titaness Thetis summoned Briarius, one of the hundred-handed Hecatonchires, to free him whilst the others argued over who would now rule in his stead. He considered Hera the prime instigator & strung her from the heavens with unbreakable silver thread for 4 days. Poseidon and Hermes swore to never challenge him again & were banished from Olympus for one year, where they had to serve a mortal king as common labourers. Zeus chose not to punish Athena, saying that she played a reluctant part in events. However, there’s only one account of her embracing battle for its own sake. army-leading, untiring / Lady, whose pleasure is fighting and the metallic din of war.” She personifies war tempered with wisdom & a love of strategy, rather. She often acts for the benefit of mortals & heroes alike. Both Athena & her uncle Poseidon wanted to be patron deity of Athens. Athena gave a practical gift to the city. She caused an olive tree to spring up near the Acropolis, thus providing people with a plant that could grow in the tough Greek terrain & provide them with food, a source of oil, & things valuable for trade. Poseidon sought to outdo her by striking the ground with his trident & causing a spring of water to gush forth. He is the ocean personified, so the water was salty. Athena’s gift to the city was considered to be more useful, so she became the city’s patron deity. She sponsored the hero Perseus on his quest to slay the gorgon Medusa. The goddess provided him with a sword & shield. She also whispered in his ear & suggested he use his shield as a mirror to avoid looking directly at the killing gaze of the gorgon & avoid being turned to stone. Athena also aided Jason, Odysseus & Herakles in their adventures. Despite her divine nature, she is perhaps one of the most ‘human’ of the gods. She can be vain like any other woman in her rare moments of weakness. When Eris, the goddess of discord and strife, failed to get invited to a wedding she decided to stir things up by throwing a golden apple into the crowd inscribed with the words “for the fairest”. Hera, Aphrodite, & Athena each tried to claim it, prompting the beauty contest which ultimately lead to the Trojan war when Paris abducted Helen of Troy when he claimed the prize Aphrodite offered him for choosing her. She is capable of the same emotions as the rest of us & can be embarrassed. Athena is given credit for inventing the flute. She was proud of her efforts & went to show it to the other Olympians. However Hera & Aphrodite laughed at her, making fun of the way her cheeks puffed out when she played. Athena caught her reflection in a fountain & could see their point. She then threw her creation away in disgust. No other goddess personifies both timeless wisdom & ever-growing civilisation. Athena possesses reasoning, logic, & boundless intellect that reaches across the ages. She asks us to use that wit, practicality, & creativity to reach our goals. Her ‘human’ side allows us to approach her when we are in need. Remember her at this time of year, & always. If you are looking for a powerful goddess to connect with, Athena may be a great choice. 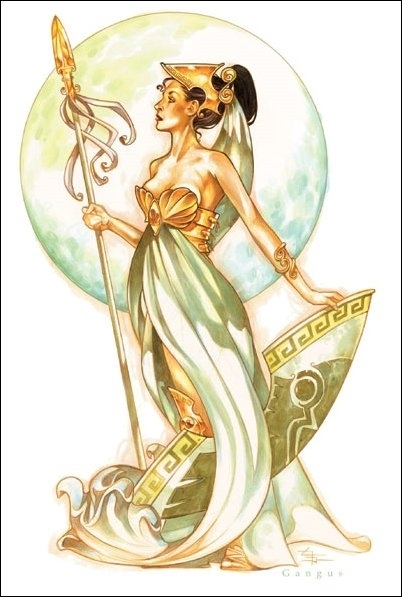 Let’s take a look at what Athena represents and her attributes. Athena is the Greek Goddess of wisdom, war, the arts, industry, justice and skill. She was the favorite child of Zeus. She was born from Zeus’s head after Zeus swallowed Metis when she was pregnant with Athena. Athena’s symbols are the Owl, signifying watchfulness and wisdom; the aegis (small shield) showing the snaky head of Medusa. She protects heroes and was known as the Goddess of Heroic endeavors. She was a master negotiator and could create peace through negotiation. So how can you connect with Athena in this way? You can invoke Athena when you need to resolve a situation. For example, say you are trying to bring family members back together or negotiate a raise. Athena will help you find the right words and solutions to resolve the issue. You can also pray for soldiers and those fighting in battle – she protects their heroic actions.
. Athena is the patron of weavers, potters, goldsmiths, sculptors, musicians, and horsemen. She was also credited with the inventing the first sailing ship, the yoke and the bridle, as well as the flute and trumpet. Invoke Athena when you need creativity or need help musically. If you know a musician, talk to them about Athena. If you are creating something, such as scrapbooking or sewing, she can help inspire you. Athena is also associated with the city and urban lifestyle, during peacetime she oversaw the progress of civilization, including being the patrons of literature and the arts. Are you looking to take pictures or find some art for your office or house? Are you a writer, creator, artist? Are you interested in helping your community? All of these things could use Athena’s influence. I ask for your help awakening my wisdom. Right now, I have problems that I would like to work on. I need help with negotiation in my job. I ask for your guidance on these issues because I don’t know where to turn. I admire you as a powerful and strong woman. Please help me to step into my power. I crave the right path – I need your help in finding it. Please, wise Athena, help me find my way. Athena is the modern day peace promoter and creator. Her influences can carry far and wide in your life if you’re looking for strength, power and creativity.